I have a large colony of ants in my yard (or possibly many colonies) in Surprise, AZ. These ants are becoming a small problem because they love to bite my family. So far I have tried many "ant baits" and found that they ignore all of them except for amdro pellets which contain Hydramethylnon. Boiling water works great on them when I can locate their hills, but they always return. Any information on what kind of ants these are and how to eradicate them will be very appreciated! Thank you in advance! I wish I had some encouraging news for you, but it's likely you have Solenopsis xyloni, a close relative of the Red Imported Fire Ant, Solenopsis invicta. You're already doing some of the most effective things: Amdro was developed specifically to target S. invicta (or RIFA, as it's sometimes called in the invasive species literature). It works best if you pour about 1/4 cup directly onto the mounds, and re-treat every 2-3 weeks. In general, poisoned baits usually kill at most about 90% of the colony, so re-treatment is essential. Boiling water, as you said, is also great when you can find the colonies. Just don't pour it over the Amdro! It doesn't work when wet! The problem is, unless you and your family live on a 1,000-acre ranch, miles away from town, surrounded by a moat and a flying-ant-proof fence, you'll always risk re-infestation from the surrounding area. Therefore, the only further advice I have is to get organized with your community. It might make sense to bring this problem up with your neighbors, at your children's schools, and any local organizations you're involved with. The "School of Ants" is a citizen-science project that would be a fantastic way to gather information about where other colonies of these ants occur in your area...and the students might even learn a thing or two about the biology and ecology of ants! One critical bit of information you can get from collaborating with the folks at "School of Ants," or other experts, is a positive identification of these specimens. Solenopsis invicta and Solenopsis xyloni are difficult to tell apart from pictures, but one is a native ant that can be a nuisance, and one is an invasive ant that costs the USA more six billion dollars a year to control nation-wide. More information on Solenopsis invicta, and some advice about distinguishing it from related species, can be found on this excellent site. Either way, you have the opportunity to raise awareness in your community about ants, so that you can more effectively solve the problem you have now, and be prepared for future ant invasions. Wow! I didn't even know your organization existed and happened upon it by accident. Anyway, while in Namibia last spring (2012) I came upon this interesting ant while in the red dunes of Sossussvlei, Namibia. I tried to identify it when I got home, but with no luck. Can you help? Thanks for your fantastic images! The ants pictured are Camponotus detritus, otherwise known as the Namib Desert dune ant. This species is noteworthy not only for its striking appearance, but also its peculiar adaptation to the extreme aridity of the Namib Desert. You can read more about their distribution, behaviour, and unique physiology here. I am Natalie, I'm in 8th grade in chicago and i Am doing science fair, I am putting ibuprofen in ants food and drink. My question is: Will trace amounts of ibuprofen affect the behavioral patterns of red harvester ants? I have both on my ant farms set up, and 15 ants in each, I just would like some help along the way so i can do a great science fair! - How will you measure the behavioral patterns of the ants to see if they are different? There are many ways to do this, but you will want to come up with some way to standardize your measurements. Will it be how much food they consume and how will you determine this? How often the ants are active versus not moving for specific periods of time that you are watching them? How often do the ants engage in different behaviors between the treatments (grooming themselves, grooming other ants, etc.)? There are lots of observations you could make, just be sure to decide ahead of time what you will do. One idea might be to just spend some time watching your ants before starting the experiments to get ideas. - To insure that you are measuring the effect of the ibuprofen, you will need to have a "control", which in your case would be a group of ants that you are not feeding ibuprofen, but otherwise are treated and fed exactly the same. This will allow you to determine if the ibuprofen is what is causing the differences. - You would ideally also like to have multiple pairs of ants that are and are not fed ibuprofen (but I realize this may not be possible for your project this year). We hope this helps and have fun watching your harvester ants! Harvester ants from the genus Pogonomyrmex are beautiful animals (to see what they look like up close click here). Hi -- I was visiting Guarulhos in Brazil recently, and I found these ants in a tree or bush interacting with other insects. I suppose they are Camponotus atriceps or Camponotus mus and the insects probably a kind of cicada. I have to send the picture to a outdoor photography magazine and I need the Latin name, at least the genus. The picture was taken at the gardens of the Cesar Palace Hotel near to the international airport. One of the photos is of what looks like to be the nest. Can you get to me information about the other insect or the plant? First, the bad news. I am sorry to say I cannot identify the plant in the pictures. On the other hand, from the perspective of the AskAnt Team, you are really fortunate to have traveled to Brazil, one of the most ant-rich places in the world, where even an urban hotel garden can reveal fascinating aspects of ant behavior. The ants in your pictures are a species common both in the wild savannas and in gardens of that part of Brazil, namely Camponotus rufipes. (C. atriceps is a litttle smaller, and much shinier, and C. mus is considerably smaller with whiter hairs). When their nest is disturbed, C. rufipes can be very aggressive, delivering a strong bite into which they may squirt caustic formic acid. I had one draw blood from my finger one time, when I was doing field work in Brazil! It is one of the few ants that can do this. The ants in your lovely pictures are associated with two types of sap-feeding insects, scale insects (round and featureless, Hemiptera: Coccidae) and planthoppers (colorful and cicada-like, Hemiptera: Fulgoroidea). Both of these animals excrete excess sugar and water from their plant sap diet in the form of honeydew (melaza in Spanish). Like many ants, C. rufipes is fond of sugar, and lingers around the honeydew "factory" to gather this waste product as it is produced by the sap-feeding bugs. you could say that one insect's garbage is another insect's treasure! The honeydew bugs in this relationship are sometimes referred to as ant-cattle. The ants also defend the bugs from parasites, predators, and competing ants. This ant is known to make a nest of cut grass, a picture of which can be seen at the link in the next paragraph. Out in the savanna, this ant may nest in low, wet areas, and its nests may be suspended among grass stalks above the saturated ground, looking something like birds' nests. As your second picture shows, the ants also use bits of grass to build structures covering their "cattle", an additional way to shelter them from enemies. Partly chewed and glued-together plant fibers used by ants for construction are referred to as carton. Here's a post about C. rufipes at one of our favorite blogs: http://myrmecos.net/2012/06/13/answer-to-the-monday-night-mystery-camponotus-rufipes/. Another post at the myrmecos blog lists this ant as the 48th most published ant species (among over 12,000 species to choose from). Your intention to publish these photos in an outdoor magazine will make them just a little bit more well-published. Thanks for your question, Nathalie! It is true that ants are proportionately much stronger than we are. I don't think any human could dangle from the ceiling with 100 times his or her body weight, like the weaver ant Oecophylla pictured here. There are many adaptations that are working together to allow ants to perform impressive feats like these: hairs on their feet that can stick to very smooth surfaces, large muscles in their heads to close their jaws, and light lean bodies. Most worker ants don't have functional reproductive systems, so their strength-to-weight ratios are higher than many other insects that are weighed down with the burden of perpetuating their genes. However, comparing the proportional strength of even the strongest humans to an ant is unfair. Even lions, tigers, and bears (oh my!) can't lift more than 10 times their own body weight, as many insects can. Some of the physics behind this is explained here. 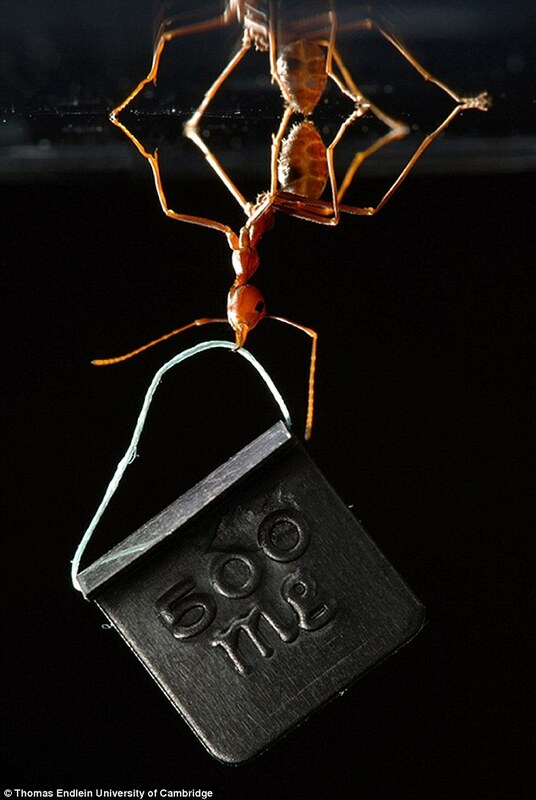 The strength of ants is "super," but it is not super-natural. It all makes sense once you know a little more about physics. Briefly, smaller organisms will always have bigger strength-to-weight ratios, because it's the surface area of the muscle cross section that determines strength, but the volume of the animal that (all else being equal) determines mass. Less briefly: imagine three perfect cubes, each of a different length: 2cm, 5cm, and 10cm. The 2cm cube has a cross-sectional area of 2x2=4cm^2 and a volume of 2x2x2=8cm^3. The 5cm cube has a cross-sectional area of 5x5=25, and volume of 5x5x5=125, and the 10cm cube has cross-sectional area of 10x10=100 and 10x10x10=1000. If these cubes were animals (admittedly, very strange ones), the 2cm cube could have a strength-to-weight ratio that was proportional to 4/8, while the 5cm animal's strength to weight ratio would be 25/125 = 1/5, and the largest, 10cm cube-animal would have a strength-to-weight ratio of 10/1000 = 1/100. Of course, this is an oversimplification, but I hope this helps clarify why all of the proportionately strongest animals are very small. Although this is an ant blog, I feel it is only fair to point out that ants are not the strongest insect, even proportionately to their body weight. The prize goes to a dung beetle, which can drag more than 1000 times its body weight. These beetles are larger than any ant, which makes their strength-to-weight ratio even more impressive. The feat of strength in which ants have beetles beat is how rapidly some of them can close their jaws. Ants of the genus Odontomachus can close their jaws at speeds of up to 230 km/hr (143mph), generating a force that is 500 times their body mass. Not only are these forces very effective at subduing prey and smaller enemies, some of them can use their jaws to launch themselves into the air. This youtube video is completely worth checking out if you like wathching slow-motion ants flail through the air. For a more dignified synopsis, one of the original articles on Odontomachus jaws is here.